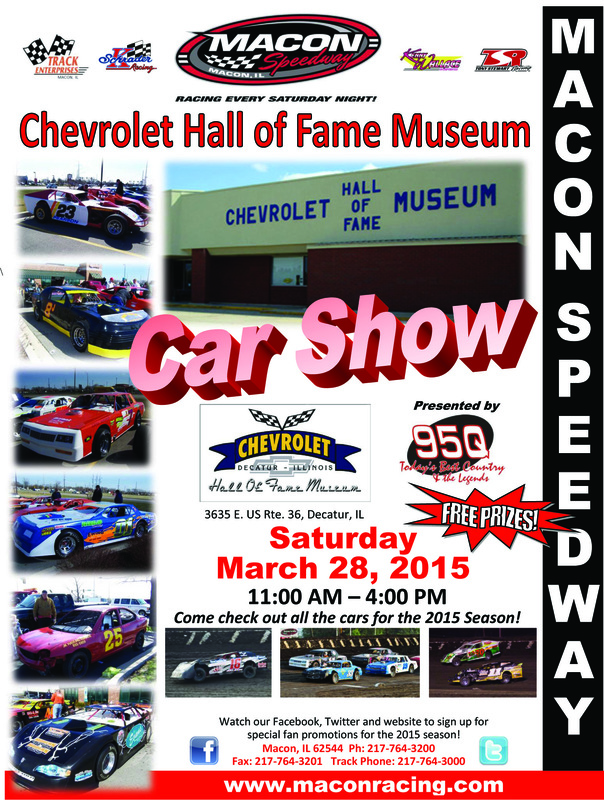 The Chevrolet Hall of Fame Museum and Macon Speedway have partnered up to bring you an amazing car show to kick off the 2015 racing season. The car show will take place at The Chevrolet Hall Of Fame Museum on Rt. 36 East in Decatur, IL on Saturday, March 28 starting at 11 a.m. and lasting until 4 p.m. Come and see all the same cars that race at Macon Speedway each and every Saturday night throughout the summer and check out the two-seater Macon Speedway show car. Join us as we check out all the cars that will be kicking off the season at Macon Speedway at the Sixth Annual Spring Fling Season Opener on April 18. Macon Speedway’s season opener will feature Quick Car Pro Late Models, UMP Modifieds, Sportsman, Street Stock Big 10 Series, and Outlaw Hornets. Pit gates open at 4 p.m., grandstands at 5 p.m. and the 2015 season will kick off at 7 p.m. The winter is heading out, and the temperature is warming up, so bring your friends and family out to the track to help us kick off the racing season! Macon Speedway is located 9 miles south of Decatur, IL on US 51 then .6 miles west on Andrews Street, then south on Wiles.